I have been thinking a lot lately about how evil people can be. Amber Dubois and Chelsea King were recently murdered here in Southern California. They may have been murdered by the same person, or not, but which would be worse? That this guy, Gardner, would kill at least twice? Or that someone else killed Amber and is still on the loose? I joined a search for Chelsea King group on facebook, and that made my heart ache even more because after seeing the pictures of her living life, it made it all that more real. These girls were my sisters age. It could happen to anybody! It used to be okay to go running by yourself, but now it's not safe to go anywhere it seems. 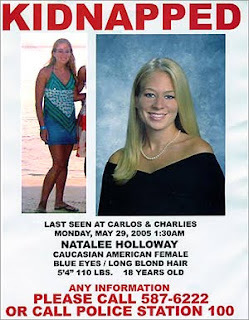 Then, last night, I was watching a lifetime movie on the story of Natalee Holloway. I remember when she was missing, but I never knew the whole story. I do remember seeing a clip of Van der Sloot in the car with the hidden camera, talking about her. I remember thinking "Why is he not arrested? He is pretty much confessing right here!" But nope. Nobody has been formally charged. Another young, innocent girl- murdered. It's starting to really just break my heart. I cried for these girls. I didn't know them. I don't know anyone who knows them. I just feel so sorry for the fear and pain they felt. And for the families and friends who are left behind with this loss. I'm so terrified that this will happen to someone I know. For as long as I can remember, I have always been very paranoid when I have been home alone or walking in the dark alone. I start thinking about what I would do in different scenerios and what I could use around me as a weapon. I now carry pepper spray with me on my key chain. We have a gun in our room for protection because Michael works nights. It's hard to even want to bring a child into this world where things like this happen. Michael tells me we need to bring more of the "good guys" into the world to fight the good fight. It's just so risky these days. Especially if you have girls. Please sign this petition. It takes about 60 seconds. It could save a life.